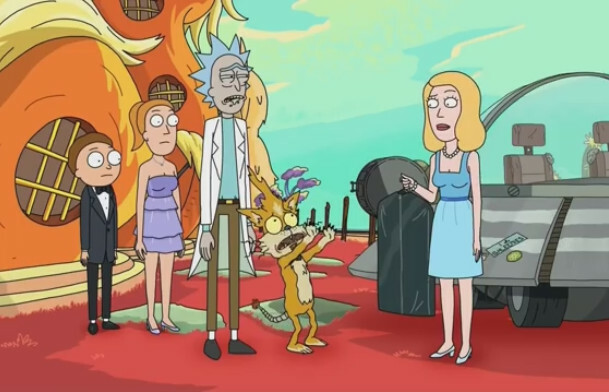 In an episode called ‘The Wedding Squanchers’ we’re introduced to the cat-like character Squanchy on Planet Squanch and, more to the point, to the improbably versatile word squanch. The word’s hyperpolysemy quickly becomes a running gag. Squanchy tells Rick his house party is squanchy and that he likes Rick’s squanch (style, I think). Then a specific verb use of squanch takes us into adult territory. Well, it is Adult Swim. One of daftest and dustiest old grammar myths is the unfounded rule against ending a sentence with a preposition. This fake proscription seems to have been invented by a Latin-loving John Dryden in 1672 and, like an indestructible demonic meme, continues to gnaw at people’s minds centuries later. Some even believe it. What did you bring me the magazine I didn’t want to be read to out of about “‘Over Under Sideways Down’ up from Down Under” up around for? See Futility Closet for context, involving recursion and lighthouses. After I linked to it on Twitter, a couple of people pointed out that the line cheats by ignoring the use–mention distinction – that is, many of the prepositions aren’t used as prepositions. (Also: adverbs.) But I think cheating is allowed here in the interests of silliness. A bit of seasonal silliness from the current issue of Viz comic (#221). You might remember the Monster A Day drawing blog that prompted my short verse about a whispering shell. Here are two more whimsical rhymes, best read in tandem with the lovely illustrations. In the cosy excitement of a paperback book. When it darts with a blur past the grandfather clock. Of a sock that just wants to be sock-monster-raced! On an unrelated note, I’m honoured to be included in Lexiophiles’ top language professional blogs and top language Twitter accounts 2012. Many thanks to the kind reader(s) who nominated me. You can browse the lists for languagey goodness, and you can vote for me at Sentence first and @StanCarey, or for whatever takes your fancy. Update: The results are in, and this blog and my Twitter page both placed respectably: #21 in the language blogs, #14 in the language Twitterers. Considering I mentioned it only in passing, and tweeted about it just once, I’m quite amazed. Thanks to all who voted, and to bab.la and Lexiophiles for the fun and games. Here are excerpts from my latest two posts for Macmillan Dictionary Blog. Reduplication can be categorised as follows: exact or repeating reduplication (bye-bye, hush-hush, goody-goody), rhyming reduplication (itsy-bitsy, okey-dokey, boogie woogie), and ablaut reduplication (chit-chat, tip-top, riff-raff). Ablaut is a term introduced by Jacob Grimm; it refers to vowel change, which in reduplicatives often follows certain patterns: zigzag, knick-knack, mingle-mangle, or criss-cross, flip-flop, sing-song. Poppycock, bunkum and rawmaish looks at our words for nonsense. Many of them, such as those listed in the next paragraph, are colourful, old-fashioned English terms; rawmaish is one that overseas readers are less likely to be familiar with: it’s an Anglicisation of the Irish word ráiméis, meaning nonsense or foolish talk. Many words for nonsense have an entertaining, almost clownish feel. Think of baloney, balderdash, piffle, gobbledegook, gibberish, poppycock, flapdoodle, twaddle, tommyrot, hogwash, hooey, and a load of old cobblers. These are words to delight in, flamboyant terms that parade themselves in a sentence . . . . Both articles have benefited greatly from the discussion in the comments, where readers have shared their favourite reduplicatives and words for nonsense, sometimes in verse form. More thoughts are always welcome, and my older articles are available here. They have a beak but not a bill. Littler things they tend ta kill. Jeremy’s post links to Kory’s helpful and popular video for Merriam-Webster about the various plurals of octopus, and to an excellent Stæfcræft & Vyākarana post on the same subject. To these I will add this useful discussion at bradshaw of the future, who notes that “usage trumps etymology every time”. I prefer the plural octopuses, except where rhyme or rhythm warrant one of the alternatives. An adequate summary of their merits would require several paragraphs, which would be pointless given the links above: all are worth a moment of your time, if the topic interests you. Wikipedia also has a decent, well-referenced account.